It’s been 79 years in the making and last week at SHOT Show, Brownells joined the ranks of America’s gun manufacturers. Given the company’s long history of serving the firearms community with firearms, parts, and accessories, it only makes sense the company’s first firearms are legitimately old school – retro AR-15 rifles that will appeal to those interested in historically accurate recreations of early models of America’s Rifle. Brownells newly-created Retro Rifles line features four 5.56mm variants and two .308/7.62 variants. The 5.56mm models feature the correct styling for rifles issued to GIs in the 1960s. The .308/7.62 models reflect the lightweight styling of Eugene Stoner’s original AR-10 design. 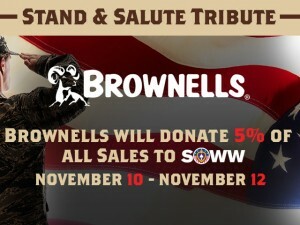 Brownells is making its annual Veterans Day benefit for Special Operations Wounded Warriors bigger than ever, and will donate a portion of three days’ worth of sales during the “Stand & Salute Tribute” to the non-profit veteran support organization. The NRA Board of Directors elected the next generation of leadership for the nation’s oldest civil rights and sportsmen’s group, electing lifelong NRA Life Member Pete Brownell as President May 1, capping off the 146th NRA Annual Meetings and Exhibits in Atlanta. 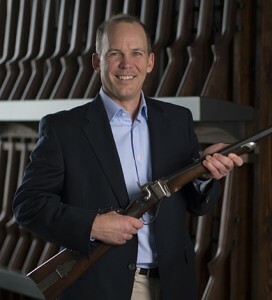 Brownell, whose entire life has been dedicated to the outdoors and shooting traditions, is the CEO of his family’s namesake business and firearms industry leader, Brownells, Inc. Under his leadership, Brownells experienced a ten-fold growth from a “niche-specific supplier” of gunsmithing tools to an international company offering firearms, parts, ammo and accessories to shooters, hunters, gunsmiths and retailers worldwide. His Iowa roots rich with shooting and hunting heritage combined with his family’s commitment to serve and uphold those traditions set the stage for Brownell to seek election to the NRA Board of Directors in 2010. Since then, he has served as chairman of the Membership Committee, and as a member of the Finance, Law Enforcement Assistance, Publications Policies, and Sport Shooting Committees. He was elected as the NRA’s Second Vice President in 2013, and elected as First Vice President in 2015. He succeeds Allan D. Cors to become the 64th President of the NRA. Brownells is issuing an open casting call to gunsmiths for the cover of the next “Big Book” catalog to celebrate the 70th year of its publication. Long regarded as the unofficial “Bible” of the gun industry, the Big Book is famous for its amazing selection of thousands of the best gunsmithing tools and products, and its large, horizontal format. Some lucky gunsmith will see a photograph of himself and his shop splashed across the 12″ x 9″ cover of Big Book #70, which will be distributed to gunsmiths and dedicated hobbyists across the United States and around the world. Contestants can enter for their chance to grace the cover of Big Book #70 two different ways. 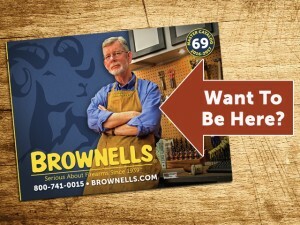 They can email their best photos of their gunsmith shop or work area to Contests@Brownells.com, or post the photos on social media and use the hashtag #BB70. The photo contest begins immediately and Brownells will accept submissions through March 31. In addition to being on the cover of Big Book #70, the winner will also receive a Brownells gift card worth $500. Brownells will individually contact those who post cover-worthy photos via social media. Brownells and Smith & Wesson have collaborated to create a highly-customized, America-themed version of the Smith & Wesson M&P M2.0 pistol. 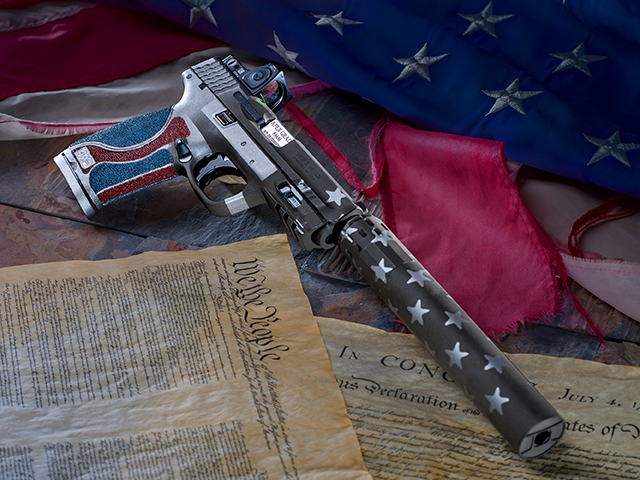 Designed to show off each company’s strength – the legendary firearms built by Smith & Wesson, and the extensive selection of firearm accessories from Brownells – The All American Dream Gun boasts the very best in American firearm innovation and creativity. Using the newly-released Smith & Wesson M&P M2.0 4.25” pistol chambered in 9mm as the canvas, the experts at Brownells sought to customize four areas of the firearm: trigger, sights, silence and patriotic style. Because the M&P M2.0 pistol features a new and improved trigger, the mechanism itself was left alone. Brownells built upon those improvements by simply replacing the trigger shoe with an Apex Tactical Specialties AEK trigger to aid in consistent trigger pull. Learn about the hottest new Brownells products from the best brands from Merchandise Manager Paul Levy. Streamlight ProTac Rail Mount 2 – High-powered weaponlight comes with Picatinny rail mount, push-button tail switch, remote pressure switch and mounting hardware. Runs on two CR123A lithium batteries, included. Beam can be switched from a blinding 625 lumens down to only 60 lumens for maximum runtime. User can choose between momentary- and constant-on modes. Also has a strobe function that can disorient a threat. Magpul QD Paraclip Adapter – Steel adapter fits into QD swivel sockets and allows use of slings with Paraclips and other clip-in-style attachments. Eliminates need to buy a whole new sling. Tough Melonite coating resists wear and corrosion. TangoDown Vickers Tactical Magazine Extension For Glock 43 – Durable polymer magazine extension replaces factory Glock 43 magazine floorplate and adds 2 rounds capacity. Extension has outer covering specially shaped to enhance the firing grip. Comes with proper-length stainless steel spring for reliable feeding. Hornady Rapid Rack – Empty-chamber indicator also works as a load-assist device to allow storage of a firearm with an empty chamber, but a full magazine. Cartridge-shaped portion of the Rapid Rack inserts into an empty chamber, while red handle portion sticks out, indicating unloaded and safe. Firearm can be instantly loaded by grasping the handle and pulling sharply to the rear. Rapid Rack will fall out and next live round in the magazine will be charged. Available for AR-15, AR-Style .308 firearms, and certain 12 gauge shotguns.